This past fall, I had the gift of doing some writing with my daughter on the role horses play in examining human relationships. Due to the prey niche this magnificent animal resides in, horses have evolved to be extremely sensitive to the slightest of nuances of body language. As a marriage and family therapist utilizing equine assisted therapy, my daughter has learned to integrate the horse as part of the therapeutic team. 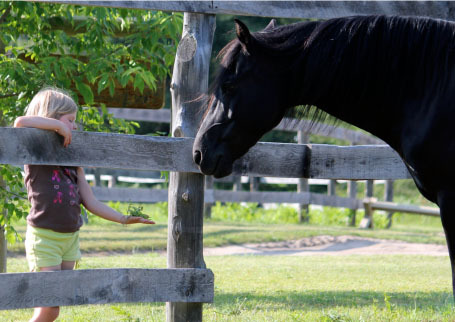 When working with clients in the presence of horses, the horses are able to sense the emotional climate of the client. Helping the client interpret the actions the horses present creates a window into issues presenting themselves in their lives. Congruence is a term used in therapy. To be healthy, we need to learn the art of congruence, that is, the mirroring of our outward actions with our inner world. Horses sense when humans are incongruent. Their very survival has depended on that skill. Their response is dictated as much by what we are feeling as by what we are doing. The practice of natural horsemanship has arisen in response. In natural horsemanship, the human first calms him/herself, then enters the world of the horse, speaking the language known by horses. If the horse can read calm confidence, they will respond in kind. If they read fear, anxiety, or anger, they will also respond in kind. A horse trained under a model of natural horsemanship becomes a partner in the life of the human, born not out of dominance, but out of alliance and respect. Seems to me there is a strong parallel to the classroom. Students are masters at reading the inner fears and anxieties of their teachers. They can quickly bring an inexperienced teacher to tears. Likewise, students will respond to the calm confidence of a skilled teacher that has come to know themselves and are able to act in a way that is congruent with their inner world. They know who they are and are confident in their expectations. They are able to calmly and confidently manage he learning environment within the classroom. It is within these classroom communities under the management of a teacher that has learned the art of congruence, that deep learning and personal growth can thrive. I'm a career educator currently teaching pre-service teachers at Hamline University - Master of Arts in Teaching program. Interested in science education, inquiry-based science, and the intersection of science and literacy. This entry was posted in General, The Art of Teaching and tagged congruence, equine, Teaching. Bookmark the permalink.